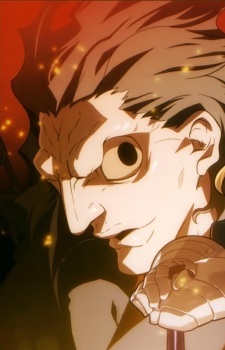 Caster "Bluebeard, Gilles de Rais"
He is the Servant of Ryuunosuke Uryuu during the 4th Holy Grail War. Caster derives pleasure from first providing his victims with a moment of relief and hope, before killing them in a variety of horrific manners. Caster was summoned shortly before the Fourth Holy Grail War began. His Master was Ryuunosuke Uryuu, a serial killer who unwittingly performed a successful summoning ritual using the blood of a murdered family. Like his Master, he is almost devoid of any morality and has no interest in obtaining the Holy Grail. He enjoys offering his victims brief moments of respite, or even the hope of release or escape, before inflicting death through gruesome and horrific means. According to Caster, allowing his victims hope will amplify the despair and terror upon their moment of death, a fact that he revels in. He also uses his magic to warp and twist humans into contraptions for his Master's entertainment, such as turning a girl into a pipe organ. His true identity is Gilles de Rais, a French nobleman who was once a comrade-in-arms of Jeanne of Arc. He first introduces himself to his Master as Bluebeard, which is the name of a fictional character based on Gilles himself. Some characters are funny because of all the crazy antics they get up to. But others just have the right kind of physiognomy, which make them prone to pulling off some funny anime faces - intentionally or unintentionally. Fate/Zero is a roller-coaster of an anime, filled with fantasy, drama, comedy, tragedy, but most of all, compelling characters. But just how historically accurate are the "Heroes of Legend" in this anime? Find out now in this detailed guide to the background of our favorite servants!